This free teddy bear game tests your knowledge of famous bears. Paddingtion, Corduroy, Boo Boo, Baloo and more! How many can you think of? 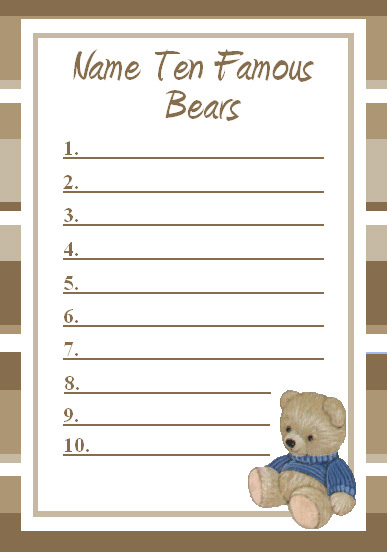 This is a simple game, free to print, and fun to play at any kind of Teddy Bear party. Instructions: Just follow the printing directions below and print out the game card below for each guest. Give each guest a pen or pencil and watch everyone get stumped on how many famous bears they can think of. Give them about 5 minutes and then stop the clock. Whoever gets 10 the quickest or whoever has the most after 5 minutes wins. Give a box of Teddy Grahams to the winner. Below are a huge list of famous bears. 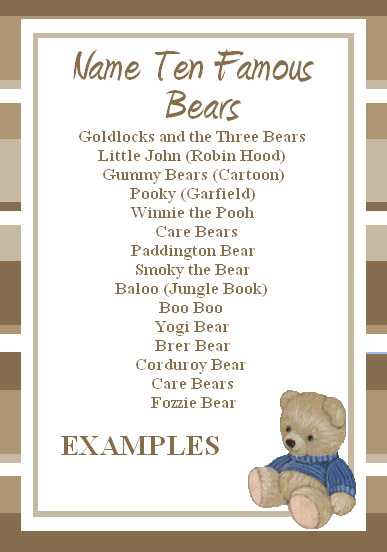 You have several options to print this Famous Bears Name Game. Whichever way you choose, I suggest that you print these game cards on a thicker cardstock for a sturdy game card. The EASIEST way to print this game is to open this pdf free teddy bear game and print it from there. You will need Adobe Reader (the latest version is recommended) installed on your computer in order to open and print this baby shower game. You can get Adobe Reader for free here (a new window will open so you can download without leaving this page). I hope this Free Teddy Bear Game is a help to you in your bear party planning!